For the nearby park, see Kalwaria Zebrzydowska park. With a vision while viewing the neighbouring hills and valleys from the Castle of Lanckorona, on 1 December 1602, Mikołaj Zebrzydowski, the Voivode of Kraków commissioned the construction of a calvary, i.e. Roman Catholic monastery and the trails of the Passion of Christ modeled on the Calvary outside the city walls of Jerusalem. The town takes its name from the monastery that was constructed on the hills neighbouring Lanckorona and the last name of its founder Zebrzydowski. The town of Zebrzydów was established in 1617 in order to house the growing number of pilgrims visiting the Roman Catholic site of worship. The town rights were expanded and the town remapped by Jan Zebrzydowski in 1640, gaining the name Nowy Zebrzydów (New Zebrzydów). In 1715, the town suffered the effects of a large fire and was subsequently rebuilt by Józef Czartoryski, its owner. The Czartoryski family Palace was built in 1729–1731. In the 1980s, it was rebuilt and remastered into the current seminary. The Habsburg Austrian Empire annexed the town as part of its invasion of Poland during the First Partition of Poland in 1772. The Austrian administration changed the name to "Kalwaria". In 1887, Jan Kanty Brandys became the owner of the town and at around 1890 the name Kalwaria Zebrzydowska was adopted. In 1896, the town lost its town rights due to a decision by the governing Austrian authorities. The construction of St. Joseph's Church began in 1905. The town returned to Poland in 1919 with the end of World War I and the signing of the Treaty of Versailles by Roman Dmowski on behalf of the Polish Republic on 28 June 1919 in Paris. 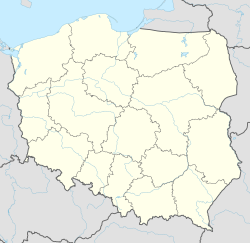 The town rights were restored in 1934 by a decision of the Polish government. After World War II, the town's economic development largely relied on the expansion of its furniture manufacturing and woodcraft industry, shoemaking, as well as a growing number of pilgrims to its religious complex. "Totus tuus ego sum, et omnia mea tua sunt. Accipio te in mea omnia. Praebe mihi cor tuum, Maria." ("I belong entirely to you, and all that I have is yours. I take you for my all. O Mary, give me your heart"). According to his Apostolic Letter Rosarium Virginis Mariae he borrowed the motto from the Marian consecrating prayer found in the book True Devotion to Mary by Saint Louis de Montfort. "Then I understood that I could not exclude the Lord's Mother from my life without neglecting the will of God-Trinity"
In 1987, Henryk Górecki composed a choral piece (Totus Tuus Op. 60) to celebrate Pope John Paul II's third pilgrimage to his native Poland that summer. While the motet opens with the same words as the apostolic motto, the piece actually uses a poem by Maria Boguslawska for its text. ^ "Totus tuus, Op.60". classicalarchives.com. Retrieved on 21 February 2009. Wikimedia Commons has media related to Kalwaria Zebrzydowska.